Thanks for your note telling me that I was banned. I must admit it was a bit of a shock. We’re writing to let you know that your account features will remain locked or limited for the allotted time due to violations of the Twitter Rules, specifically our hateful conduct policy. We do not allow people to promote violence against or directly attack or threaten other people on the basis of race, ethnicity, national origin, sexual orientation, gender, gender identity, religious affiliation, age, disability, or disease. Please note that continued abusive behavior may lead to the suspension of your account. To avoid having your account suspended, please only post content that abides by the Twitter Rules: https://twitter.com/rules#hateful-conduct. Before I answer your accusation of hate – lets set the context…. A discussion ensued, part of which was this Tweet that got me banned. I have asked you to explain why I have been banned but so far, in that wonderful way you have with customer relations, you have not answered. Was your objection (or the person who reported me) to the use of the term Queer theory? Why? ‘Queer’ is part of the LGBTQIA group and is within that an honoured term – not a term of hatred. Queer Theory is a recognised sociological philosophical theory and is called that by its creators and supporters. Surely Twitter does not consider the term ‘Queer’ to be hate speech? So perhaps it must have been the phrase ‘lets kill all the unwanted children’. I realise that you are an American company based in California, but you employ apparently highly educated people who must recognise the concept of irony. My tweet was not advocating killing unwanted children – it was responding to someone who was suggesting that. In other words I was arguing against killing unwanted children. On the other hand the person I was arguing against has posted that the baby in the womb was an unwanted parasite which could and should be eradicated, like any other virus, if the mother so wished. 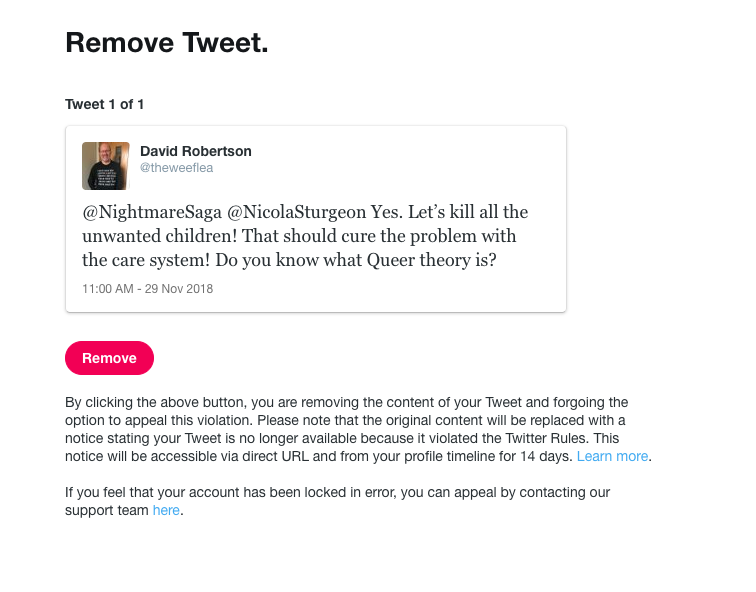 I find it bizarre that I was arguing for keeping children in the womb alive and got banned for so doing, whilst you let someone describe children in the womb as parasites that need to be eradicated continue. Is that your version of love v. hate?! Whilst I have been on your platform I have regularly received all kinds of abuse which you have seen fit to leave as acceptable and apparently fits your community standards. I won’t bore you with a whole list but let me just give some from this thread that you have permitted to remain. Thats two of your ‘hate’ categories ticked already. Religion and mental disability. Yet no ban. Or how about this one? People like me? Jews? Christians? Again it is a reference to my religion- and is a less that subtle hint that people like me should be ‘on our way out’. Again, no ban. Amazing that you consider calling someone a creepy, fat, old misogynistic religious nut (ticking about five of your boxes) fine, but arguing that we should not take the life of babies in the womb is ‘hate speech’. Of course the reality is that you are not really bothered about hate – except when you redefine it as ‘anything spoken against any ideology we approve of’. You have set yourselves up as God, judge, jury and policeman. You allow, even encourage, hatred against those who do not hold to your ideology – and you ban those who, even though there is not an ounce of hate in their speech, disagree with you. You are an authoritarian, illiberal and hate filled organisation – who cannot stand the prospect that someone somewhere might actually disagree with your self-evidently brilliant ideology. It’s almost beyond parody that you can ban someone for seeking to defend the weakest and most vulnerable in our society – and then claim that you are doing so in the name of Love! You are also a bullying organisation. Note your message to me. I can appeal the ban but it could take several days. However if I remove it and admit guilt (evidence of which will remain by a note you leave) then there is no right to appeal and if I do it again I can be permanently banned. Just like to you did to Meghan Murphy . You banned a woman for saying that a man who called himself a woman was him. You allow threats and abuse to remain on your platform yet ban someone for using a male pronoun for a male who wants to be a woman. There is a deep-rooted irrationality if not misogyny in this position. So I had a choice – admit guilt and get a short ban – or appeal it and get a long ban. It’s a despicable and cowardly way to behave. I enjoy using your platform but to be honest, the way you are going (illiberal, authoritarian and irrational bullying) I don’t expect to be able to use it much more. And of course you will go the way of all dictatorial organisations – down. The revolution will eat itself. Meanwhile I will continue to use your platform to undermine your hateful and irrational ideology. And I will do it by using logic and love – the love of the Logos. We don’t need Twitter (or Facebook, or government or the media) to be able to speak of Christ. And you will never silence us. Though you kill us the very rocks would cry out! It looks like you’re in Great Britain, perhaps? The waters that divide us (I’m in the United States) don’t mean that we couldn’t be neighbors, because here in America, folks have been talking about censorship on Twitter, too… not just on Twitter but on Facebook and YouTube. So sorry David about the continuous abuse and insults that you have to put up with. I hope you get comfort from Jesus’ words “Blessed are you when people insult you, persecute you and falsely say all kinds of evil against you because of me. Rejoice and be glad, because great is your reward in heaven, for in the same way they persecuted the prophets who were before you.” I truly hope you can bear these hurts as “light and momentary” and that you keep up the good work because you are a leader and an example, a comfort and inspiration to many. Will be praying for you and your church and family today. Agree. Let’s keep David always in our prayers. This must be very frustrating and stressful. For the life of me I cannot understand why more people do not complain about Twitter and Facebook for that matter. I think Mrs. Proudie has summed the situation up perfectly. A different organisation, but exactly the same principle. Well said David, but I fear we won’t be reading you on twitter again for a while yet. Matt. 5:11,12 come to mind, these are exciting times! Be encouraged. Rather than this vitriolic post, you should have considered humbly repenting of how your hateful posts have hurt vulnerable people? So you have nothing to repent of? Hmmm read through your time line if you were an affirming or even LGBQT believer. Your posts are full of hatred. Jesus commanded us to love, if you are not acting in love then you need to repent. I have many things to repent of. But hatred of LGBTQ is not one of them. Was your post written in love? But please feel free to tell me what was ;hateful’ about the post I was banned for. Or were you just name calling? “vitriol” = harsh and angry words. When is being truthful vitriolic? “hateful posts”? Words of great concern for your “hurt and vulnerable people”. So, if I urgently warned you of an imminent danger to your life and well being, according to your vocabulary I would be “vitriolic” and “hateful”? I agree about twitter. But also agree with some of what you said. We cannot return such hate and bias , with the same. As a Jew, i am exposed ,especially on social media, to so much irrational hate you would not believe. There is nothing one can do, as those who hate so much, will not listen. I encourage any who give an empathetic reply to my replies, not to enter into the same hate rhetoric. How we say/write things ,is very important, and let us not forget öur battle is not against flesh and blood”. Congratulations! Getting banned by Twitter is nowadays a badge of honour. Off the top of my head I can’t remember who else has been similarly banned, but I have read of plenty of other orthodox Christians being banned for non-PC tweets. Just to add that one of the people recently banned by Twitter was Gavin Ashenden, so you’re in good company. ‘Archbishop Cranmer’ wrote about this banning on his blog on 1st October this year. So sorry to hear about this. Please keep speaking the truth! Blessings from King Jesus. Madness madness it’s all madness. When that which is illogical, irrational & formally aknoledged by all medical & mental health experts as out with the realm of normality. When madness becomes sainity, there is no longer any way to define anything. When the child in the womb is charachised as a parasight to be gotten rid of, when humans who are genetically one of two sexes self identify as something they are genetically not, when unnatural sexual relations between humans are redefined as natural, all sanity is clearly a figment of individual subjective imagination. All reason, logic, science, knowledge, wisdom & reality, are lost in a sea of madness. It’s just a case of grabbing power & enforcing your particular brand of madness. This is the fight that is going on. It’s the fight of truth, justice, & sanity, against lies, injustice & madness. We might as well close the schools and universities because there are no longer any universal objective realities. We now only appear to have ideological dictates from minorities with a subversive agenda. These ideological view points are rapidly becoming universally unquestionable in the public square. The consequences of such totalitarian ideologicalies on sociaities throughout history, have & continue to be desasterious as professor Jordan Peterson points out. One such example of the inevitable result of totalitarianism is found today in North Korea! One may think this an extreme example & therefore dismisses this argument but we do so at our peril, because it is no less extreme than the social engineering we are witnessing today in Scotland. Is this really what we want for ourselves? If not, then we should be embracing those Like the Rev David Robertson, who is standing in the gap fighting for Truth, Logic, Sanity, Freedom & Justice for Human beings, in the true meaning & full essense of these terms, as defined by the only true objective reality, God. Fakery and quackery can carry on unabated, in an undisturbed comfort zone. Virtual reality , in reality unreal, fake, virtuosity. “Have you not heard of that madman who lit a lantern in the bright morning hours, ran to the market place, and cried incessantly: “I seek God! I seek God!” — As many of those who did not believe in God were standing around just then, he provoked much laughter. Has he got lost? asked one. Did he lose his way like a child? asked another. Or is he hiding? Is he afraid of us? Has he gone on a voyage? emigrated? — Thus they yelled and laughed. From the prescient pen of a one who even in this sane writing foretold his own end: from “Racca ” to being a “Fool for the LORD.” Two racca’s. “Paul can sound like the Solomon of Proverbs: “Be careful how you walk, not as unwise men but as wise, making the most of your time, because the days are evil. So then do not be foolish but understand what the will of the Lord is” (Ephesians 5:15–17). Wisdom and folly are stark opposites. Choose one and you live; choose the other and you die. But the cross has disturbed Paul’s Solomonic wisdom. Sometimes, it’s not “Be wise, don’t be a fool.” Rather: Seek the folly of God. That’s the message to the Corinthians. Paul’s gospel is foolishness to the Greeks (1 Corinthians 1:23). But it’s not just the Greeks who find the gospel folly. Paul calls the gospel “the foolishness of God (1:25), though he immediately adds that this divine folly is “wiser than men” (v. 25). 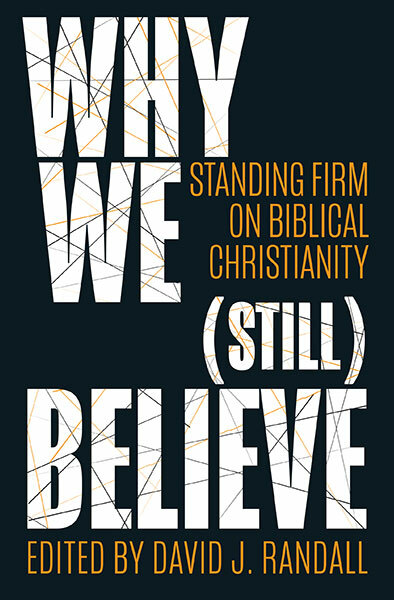 The gospel is folly, and it assembles a company of fools: “God has chosen the foolish things of the world to shame the wise” (1 Corinthians 1:27). Fools like Paul himself, who doesn’t boast of strength or prowess or success, but boasts of his weakness and tribulations. “Indulge me in a little folly,” he tells the Corinthians (2 Corinthians 11:1, 16), before going on to recount his apostolic resume of failure—labor, imprisonment, beatings, lashes, stoning, shipwreck, dangers, dangers, dangers, dangers, dangers, dangers, dangers, dangers (2 Corinthians 11:16–27; eight dangers [kindunoi], for those who are counting). Let the Corinthians boast of their prudence. Paul exults in being Christ’s fool (1 Corinthians 4:10). The choice is not wisdom vs. folly. Rather it’s a choice between follies. One can choose the short-term wisdom of anthropic folly, or the short-term folly of divine wisdom; the folly of success or the folly of the cross. David, this is a long walk of encouragement from someone who is not on twitter and has no desire to subscribe. Hope you didn’t mind me posting the fact on Twitter, David. Hardly surprising, though, given that your posts regularly hit on the head many ofn the nails of the progressive, totalitarian culture we are becoming. Where, as a famous Northern Ireland preacher once said, the new morality is just the old immorality. Sorry, I may be a bit slow, but where does your tweet say ‘lets kill all the unwanted children”? Looks to me like you said the opposite. It’s in the tweet under the heading: Remove Tweet. Tweet 1 of 1. As David has pointed out, it’s meant ironically. But some people can’t, or won’t, see that. When we met at the Gideon Convention a few weeks ago, I thanked you for standing for the TRUTH in the public arena. Pilate asked at Jesus’ trial: What is truth? And most today live in ignorance of the truth. We need able and Godly men and women like you to articulate that truth. I am sure you know this from God’s word and your own experience:…….greater is He that is in you than he that is in the world…. 1John 4:4. How sad the world would rather live by the lies…..
Keep up the good work, my dear Brother, we are already on the victory side. Twitter is never a platform for reasonable debate, education, or the “whole truth”, as the oath goes. It’s a platform for declaring snippets of ideas, spite, slander and seeking self validation. The only rules are whatever the minions with their hands on the tweet levers decide, from whim to whim. By banning or deactivating accounts that disagree with the new cultural zeitgeist, Twitter is assuring their own inevitable demise. Good riddance. It can’t be soon enough for me. Well said David, keep up the good work. We need people like you to stand up for righteousness. Pray that you keep strong and well. I don’t know how Daniel Defoe would have coped in the Twitter Age. He was no doubt amused to find his pamphlet “A Short Way with Dissenters” (i.e. let’s do away with the blighters) lauded to the skies by the High Church clergy in the time of Queen Anne. They were then duly mortified to discover he’d been, in that inelegant phrase, “taking the p*ss”. I suspect Jonathan Swift’s Modest Proposal (let’s cook and eat the Irish babies), didn’t fool anybody though. I don’t think anybody said, what a brilliant idea, or even, what a terrible idea. Probably the powers that be at Twitter would have banned Swift for hate speech. The thought police of our day have no room for nuance, wit, or rhetorical device. They’re two-dimensional people living in a grey world, even stupider than the well-fed eighteenth century clergy. Good article David, the effort by Twitter, Facebook etc to filter and control the information people are sharing is eerily similar to tactics used by communist China, North Korea and other totalitarian bodies. Twitter may label your comments as “abusive behaviour” but the abuse is actually in their controlling and censoring behavior of topics they don’t agree with. Shades of 1984! You may be interested in Bill Muehlenberg’s site https://billmuehlenberg.com/ in Australia. He seem’s to be getting regularly blocked by Facebook too for speaking out on similar topics. All the best with your ministry, you are blessing people as you speak up with a Christian perspective and love. I wonder if they reviewed your comment in context?! I wonder if it was done by a human? By a native English speaker? By a machine? I think their process rightly will place stopping comments inciting violence towards children as a priority, but I think it’s really not very accurate. The big problem is not that you have been suspended (sorry), but that so much stuff that really shouldn’t be on there is allowed to pass. When I come across a post actually threatening violence I report it. My reports always come back negative! Perhaps Twitter are simply fed up to the back teeth that, in the 21st century, there are people who still promote supernatural clap trap and condemn others, especially children, who refuse to kowtow to such utter nonsense to eternal damnation ? So you agree that anyone who posts what you consider to be ‘claptrap’ should be banned…thats atheist tolerance for you! No …. anything classified as supernatural is claptrap, and maybe after so many centuries years of having religion being deemed the yardstick for almost everything from the nonsense of creation to the basis of morality many people are saying it’s about time this silliness is shown the door. Feel free, however, to support the veracity of your religiously backed position with evidence and I will acknowledge you have a point and apologise unreservedly. Perhaps you would like to start with the Doctrine of Hell? Yes – of course to you anything that is supernatural is ‘claptrap’ – therefore of course you cannot accept any such claims – so there is no point in making them. Its like arguing with a conspiracy theorist or flat earther. But thats not the issue at stake here – the difference between your fundamentalist atheism and my tolerant Christianity is that I don’t think your nonsense should be banned from Twitter or any other platform. On the other hand you want to ban all ‘superstitious claptrap’ (ie. anything that disagrees with your faith). I did not say it should be banned. Try reading the comment a little more carefully David. As you value the right to free speech – and who doesn’t – let’s see you offer a reasonable defense of the doctrine of hell and why it should be preached to children. Yes – that is what we are discussing…the ban on Twitter – do try to keep up. AS for the defense of the doctrine of hell – I don’t think I’ll bother – you have neither the moral or intellectual framework to cope. Perhaps one day when you grow up…? Regardless, wouldn’t you agree that either way, Twitter is being blatantly hypocritical? I don’t see how any rational person would fail to see the irony. 3. David probably did fail to see the irony. 1. My comment was banned. 2. It was a 12 hour ban. I was suspended from Facebook recently; apparently for merely quoting an attitude to gay Christians, a rather unpleasant one admittedly, I don’t share. I expect it’s all to do with algorithms and buzz words. I sent a grumpy email to no avail. It probably wasn’t seen by any human. My account was reinstated after 48 hours. It’s not worth getting too upset about. It hasn’t changed what I want to say on Facebook. I’m more interested in the very real censure being orchestrated in the name of identity politics. As you know, this something LGBT rights activists like Peter Tatchell has expressed concern about. I think your next book needs to be titled “Where Angels Fear to Tweet”! David your blog is worth more than any amount of twitter accounts and God has blessed you with so much energy in this. We are praying for you. I don’t think I’ll bother – you have neither the moral or intellectual framework to cope. Perhaps one day when you grow up…? I have to say that this comes over as condescending and dismissive. I think we have a responsibility to share the gospel and doctrines with maturity and compassion. @ddeg In case you are not aware… If you had seen Arkenaten’s track record on this blog – spanning a few years I think – you would struggle to persevere with maturity and compassion and perhaps it’s sharp confrontation he actually needs. He is an irrational NFA troll He has trampled all over the grace, patience and compassion shown to him on this blog. I notice he has liked your comment. What a comment that makes about himself! How nasty! While David is perfectly entitled to express his views concerning his beliefs, religious or otherwise, when he puts them onto his blog, and leaves the comment section open it implies he is inviting responses from readers. I read and I respond as I see fit. David strictly moderates and allows through which comments he sees fit. ddeg is not the first to note David’s condescending and dismissive method of engagement with those he disagrees. Google his debates with Dillahunty and read the responses from viewers. The vast majority echo these sentiments. First off, I’m unfamiliar with the free speech rules in the UK; but from a US perspective I would defend your right to say and publish whatever you wish regardless of whether or not I agree with your opinions. However, it’s important to note that said right is a negative right — i.e. the right not to be prevented from acquiring the means to disseminate your views or to have those views suppressed via political actions — not the positive right to demand a platform be provided to advocate your position at someone else’s expense. As such, Twitter retains the right to enforce whatever comment policies it deems appropriate — just as you retain the right to impose whatever comment policies you deem appropriate for your blog. Indeed – but thats not the issue….if Twitter said it was a platform only for people of certain views that would be fine…but when they ban you for ‘hate speech’ in violation of their own stated code, then they are wrong. Nothing’s perfect. Manually reviewing the content of every single message is impossible and the automated algorithm can’t discern the context; so it’s quite likely that many innocuous messages are flagged for running afoul of the rules. I reckon that “let’s kill all the unwanted children” — or some portion of thereof — is contained within a list of forbidden words or phrases. Or someone who disagreed with you flagged it out of malice. So that explains why I’ve not received Twitter notifications for your posts David. Sad to say I’m not too surprised. It’s the PC world we live in now. You mention the case of Meghan Murphy. A lot more background information on this can be found in the article that she wrote for the Quillette website: https://quillette.com/2018/11/28/twitters-trans-activist-decree/ and in paragraphs 18-26 she makes some interesting observations about possible outside influence on the application of Twitter’s ‘safety’ policy. N.B. When she quotes some of the abuse that she has received, she reports language that some readers here may find offensive.